NEW YORK (WABC) -- The National Weather Service confirmed a tornado touched down in Mattituck in Suffolk County, New York, and also in North Haven, Connecticut. 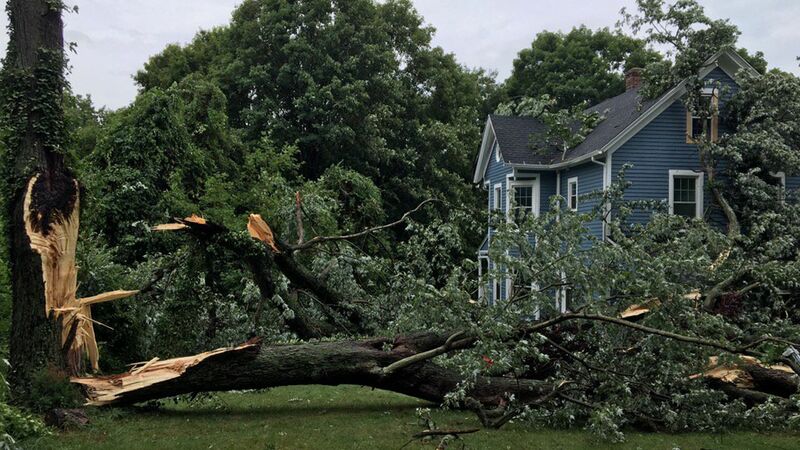 The severe weather knocked down trees and power lines, and damaged several homes in the Montowese section of North Haven, according to police. The National Weather Service confirmed that the tornado touched down in a two-mile stretch of the town at about 1:30 p.m. Wednesday. Extended power outages were anticipated as the United Illuminating Company works to restore service. The tornado was classified as an EF-0, the lowest grade on the scale of intensity. It had wind gusts of up to 70 miles per hour. Gary Lessor, a meteorologist with the Weather Center at Western Connecticut State University, said the tornado was about 12 feet wide and had a path about a half-mile long. Officials say the tornado was powerful enough to lift an 8-by-10 shed, which was dropped about 15 feet up into a tree.